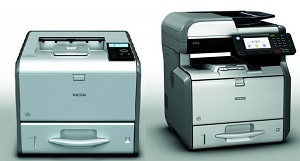 Five compact monochrome A4 machines have been launched by Ricoh recently - three multifunctions (SP 3600SF/ SP 3610SF/ SP 4510SF) and two A4 black and white printers (SP 3600DN / SP 4510DN). As well as printing with a resolution of 1200 x 1200 dpi at 30 or 40 ppm (pretty fast given their small size), these machines have functions which we used to only see on A3 MFPs: secure printing, watermarks, file encryption, printing from USB keys and even SD cards. An important new feature on these new machines is the dual head scanner on the feeder (SP 3610SF et SP 4510SF). This feature is becoming increasingly standard on A3 machines, but is still quite rare on A4 machines at this level, especially monochrome ones. The scan speeds are not as high as we see in A3 ranges of machine, or among the high-volume A4 devices some other manufacturers have placed on the market, but they provide an efficient means to scan on a machine which users will keep close by. The full specs of these machines will be available on Your DMO very shortly.